Ronda Rousey has had a couple rough years, in which her wrestling and fighting have taken on dimension new to her. On December 30 in 2016 she tried to take back the championship belt which just a couple years ago it seemed she would wear until she was old and gray before she lost it to Holly Holm almost two years ago. In forty eight seconds the fight was over and Amanda Nunes retained the title in what looks like the final end of a career in the ring for Ronda. It probably won’t be any easier for her this time than it was when she first lost her title to Holly Holm in 2015. In the wake of that defeat she found herself wrestling with depression in a real fight for life as she tried to bring suicidal thoughts into submission. It’s the kind of fight that many of us in the house of Israel know all too well. In fact, it was for this sort of fight, both real and existential, that the house of Israel received its name. Ronda Rousey had reigned as queen of MMA for thirteen championships with a string of victories unparalleled. Opponent after opponent, from Olympic medalists to Marine Corps Devil Dogs, they were all brought to the tap out with an excruciating arm bar, the very same one Ronda’s mother would lovingly wake her with in the morning when she had to get ready for school. For Ronda, Judo, MMA, and wrestling were life. And she made it fun to watch. Women’s MMA skyrocketed in popularity as Ronda not only borrowed the name from her WWF childhood hero, Rowdy Roddy Piper, but Rowdy Ronda Rousey borrowed his propensity for trash talk, too. For the combat sports this was showmanship at its finest. But it was far from just trash talk and show in the ring. Many note the difference between women’s MMA and the sport as practiced by men. Steve Holden, known to many as “Old School Coach,” is no spring chicken to the combat sports he has taught and competed in since the seventies before “Kung Fu” ever even became a thing. According to him, the women tend to be “technically better than their male counterparts.” That is, because they don’t bring as much weight and brawn to the sport, and have not been able to rely on brute strength, they have had to develop their form and technique to an exceptional level if they want to compete in the ring. The skill and discipline on display for even less than a minute during a professional bout between women the likes of Ronda Rousey, Holly Holms and Amanda Nunes, betray a drive for excellence manifested in hours upon hours a day training in the gym for months on end. It’s that kind of training Paul meant to be an inspiration for in the life of all Christians, lay or clergy, male or female, when he says: “Every athlete exercises self-control in all things. They do it to receive a perishable wreath, but we an imperishable. So I do not run aimlessly; I do not box as one beating the air. But I discipline my body and keep it under control, lest after preaching to others I myself should be disqualified.” (1 Cor 9:25-27) Paul knew of what he spoke. Far from being un-Christian like, the discipline and training that go into learning and practicing various martial arts can have direct application to the spiritual discipline needed for the Christian life of faith characterized by Israel. That was the fight for the centuries that culminated in the victory of ages. More than a mere metaphor, it far exceeds myth. 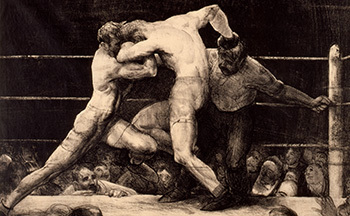 Long before His incarnation and virgin birth when God’s only begotten Son would take the form of man to wrestle with sin, death and the devil, God took on the form of a man to wrestle with man in a bout that would last from dusk till dawn. It’s a curious story on many levels. Jacob comes off as the momma’s boy that would prefer to stay in the kitchen rather than pursuing the manly sports that delighted his dad and his brother Esau who liked to hunt game in the open country. Yet, the “mama’s boy” manages to go toe to toe and grapple with God Himself, even after having his hip dislocated! No Jewish boy as erudite as Paul would let escape from his notice and inspiration the training and discipline Jacob would have had to subject himself to in preparation for such a bout, even if perhaps Jacob thought it would only come in handy for dealing with his brother Esau. Jacob, the sissy boy, prevailed and his name would be Israel. It was a fight that would put its stamp on the Christian life, and what faith would mean to the Church, where Israel still wrestles with God, sometimes late at night, sometimes in the wee morning hours. So finally our faith is a wrestling match with God, that God can only win for us in His Son Jesus Christ, through His resurrection. To tell someone in the midst of Anfechtung that all they need is faith, or they just need to believe, perhaps pray harder or that it is all in their head is not helpful. The Christian always lives with doubts. As long as they rely on themselves and their own ability to believe they will go the way of Saul, Pharoah and Judas. At times like this, regular prayer, fasting and other spiritual disciplines can be helpful, as well as can the physical exertion of a good work out or sparring match. But finally what is needed is what Luther calls the preached God, or God preached. This is how God wants to be known in His promise of death and resurrection, rather than how God is often experienced in life. That is in times of Anfechtung, when Luther says a “Christian can’t tell if God is the devil or if the devil is God.” (Reinhuber, pg. 111) This is not a God the Christian will find it easy to “fear, love and trust in above all things.” And thankfully this will not be the sum total of the Christian life either.